Rebecca and Tom envisioned and have grown Black Kite Cellars from the ground up, founding the winery in 2003 with Donald and Maureen Green, Rebecca’s parents. After meeting as students at University of California, Berkeley and marrying in 1981, Rebecca and Tom discovered fine wine from Burgundy in the 1980s. Their love of Pinot Noir was nurtured and deepened on a bicycling trip in Burgundy. They love the refined and nuanced nature of wine that comes from the Pinot Noir and Chardonnay grapes. Black Kite is a work of passion for them and a chance to develop outstanding, site-specific fine wines in the Burgundian tradition from exceptional vineyards along the California coast. It is also a chance to develop a winery and legacy that their son, Duncan, and nephew, Michael, will eventually lead. 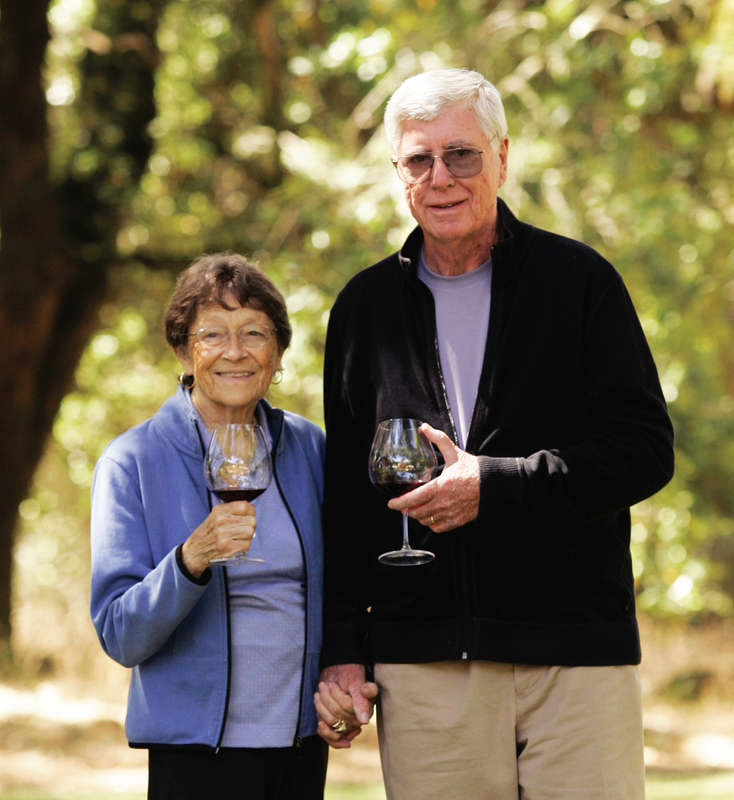 Donald and Maureen Green are the British born and bred co-founders of Black Kite Cellars. Donald and Maureen moved to the United States in the 1960s and have lived and worked in Sonoma County for the last 25 years. They purchased the land that became the estate Kite’s Rest Vineyard for Black Kite in 1995. Black Kite embodies their love of America, California and the wonderful agriculture and wines of California. Donald is now retired after a storied career as a telecommunications entrepreneur, and they are both well known for their philanthropy in Sonoma County. They are the lead donors for the Donald and Maureen Green Music Center at Sonoma State University, and the new home of the Sonoma Humane Society. Rebecca is Donald and Maureen’s eldest daughter. Michael has been affiliated with our estate Kite’s Rest Vineyard long before Black Kite was founded. The vineyard land in Anderson Valley was originally owned by Michael’s maternal grandparents, Nancy and Bob Bagnall. The Bagnalls purchased the land in the 1950s and spent decades enjoying this unique property on the banks of the Navarro River. In the 1960s they built a house and planted a small four acre Gewürztraminer vineyard. After thoroughly enjoying the land for decades, they sold it to Michael’s paternal grandparents, Donald and Maureen Green in 1995. Michael and his wife, Wendi, have spent their careers in the California wine industry, and bring their expertise, youth and energy to Black Kite Cellars. Jeff joined Black Kite as our consulting winemaker in 2005. He grew up around vineyards in Sonoma Valley and has been a winemaker in northern California for 35 years. He began his winemaking career with Chateau St. Jean under the tutelage of renowned winemaker, Richard Arrowood (recently called “one of California’s greatest living winemakers” by Steve Heimoff). Arrowood was one of the earliest proponents of small-lot, single-vineyard wines, and the significance of each vineyard site. Jeff was part of the winemaking team responsible for the winery’s celebrated 1996 Cinq Cépages, which was named Wine of the Year in 1999 by Wine Spectator. Jeff is as passionate about growing grapes as he is about making the wine. He has received critical acclaim for his site-specific focus, elegant and restrained style and deft winemaking technique. In 2015 he was named Winemaker of the Year by Robert Whitley. In addition to Black Kite Jeff has his own label, Saxon Brown, which produces a variety of site-specific wines.